Shou sugi ban, as I see it. I’d post some images, but the site is apparently broken for me. Shou sugi ban is an ancient Japanese wood treatment mainly for preservation, but accidentally for looks. I cut out my chair parts down to the band saw. I no longer need to route off the corners, the method mellows them nicely, I don’t need the drum sander, no sanding required. Then I line them up on my saw horses with a couple fencing poles, metal, and bring out the 30lb propane jug and a good roofing torch. Burn the wood till you see it blacken and start to crack. You can stop before it cracks, or you can crack the hell out of it, it’s called alligatoring. Makes the burnt wood look like alligator skin. Then I change the horse set up and put a few old plywood cutoffs down and a few blocks to screw into them to clamp the piece I’m working on. When the piece is secure on the bench, (by the way, do this outside), I get a good 2×6 wire brush and brush all the char off. It will groove the wood and give it a nice texture. When they are all brushed off, take out the hose and wet them down and use a stiff nylon brush to clean them up using the hose to wash off the char. 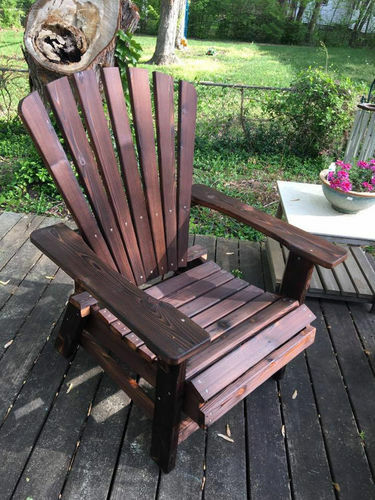 Let them dry out in the sun, then I take a large bowl and put some tung oil in it, I also put a bit of danish oil for a little color, then I use a paint brush and wet every piece with tung oil….all over. Get it nice an wet. Let that dry and assemble the piece. From what I’ve heard, this is the classic way to do it. The theory is that very small microscopic pieces of char get into the pours of the wood, fouling it for bugs, keeping it from rotting, and considerably extending the life of the wood up to 80 years. Some people swear you have to keep the char on or you’ll defeat the purpose, but they are wrong. 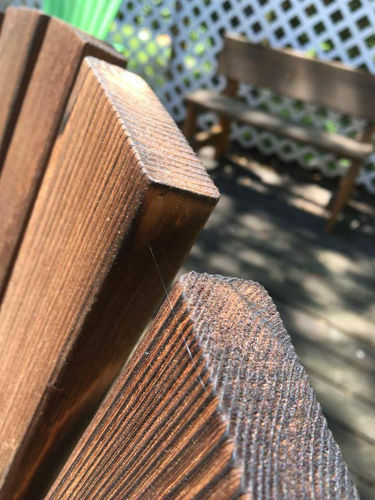 The char protects the wood on a microscopic level and the winter growth has been toasted so the result is a very good finish. Trying to keep all the char on is like using wood with bark attached, it will flake off constantly. Looks great. I’m looking to do this for an entertainment center. Do you need to wash it down with water or is that step just to help get the rest of the dust off? Water helps the dust to not become airborne so you don’t breathe it in. RussellAP thanks for the reply. I was thinking the water was more for stopping the burn, possible embers. I’ll be using a weed torch on the driveway. All my test pieces (with a plumbers torch )I’ve torched and take straight to the brush. Didn’t notice any residual embers on those. I have done Shou Sugi Ban on a few boxes in the past, but reading this gave me the ideal to use it when I build my BBQ cart. Shou Sugi Ban the frame of the cart. Don’t have to buy paint for it now! BTW the top would be white oak, so it would be a great contrast. Russell, that chair looks great, do you use any kind of finish on it after you burn and brush it?